So, you think you're a master at giving directions? We're sorry to say it, but you probably aren't, and it isn't necessarily your fault. The thing is that even if you know the route to a specific destination by heart, you have no idea what's going on in the other person's head. There's no guarantee that whoever you're giving instructions to is familiar with the landmarks and street addresses you're providing. But you know what makes giving directions much easier? A map. And you happen to have one sitting right in your pocket. 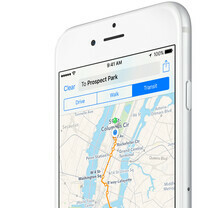 Virtually every new smartphone comes pre-loaded with digital maps of some kind. Most Android phones rely on Google Maps, Windows Phone handsets come with Bing Maps out of the box, and the iPhone has Apple Maps. These, paired with the handset's GPS radio, are great for finding your way around. That's their main purpose, after all. But they can also be used for sharing specific locations with others, and in this post, we'll show you how to do that on an iPhone. Plain ol' text messages (aka SMS) are far from extinct, but they're definitely headed in that general direction. The reason for that is the increasing popularity of instant messaging services – WhatsApp, Viber, Facebook Messenger, Google Hangouts, and Apple's own iMessage, to name a few. They're fast, reliable, and practically free, as long as you don't count the minuscule amount of data they consume. Better yet, IM clients go far beyond letting you chit chat with your crush. Location sharing, for example, is built right into most of them. Open the thread with the person (or people) to whom you wish to send your location. Then tap on Details button in the upper corner. Note that the button will not appear if there are no messages in the thread. The "Send My Current Location" button sends your location immediately and only once. The "Share My Location" button will broadcast your location for an hour, until the end of the day, or indefinitely – whichever option you choose. This method won't let you share locations other than your own. Open the thread in which you wish to post a location. Tap on the three little dots on the toolbar. Try your best to not get distracted by the ton of GIFs that just appeared. Tap on "Location" at the very top. By default, a pin will be dropped at your current location, but you're free to mark a specific point on Apple Maps anywhere in the world. Move the map around to do so and use pinch to zoom in or out. You may not share your location over time as you can in iMessage. Open a thread and hit the location button in the toolbar at the bottom. Your current location will be pin-pointed on the map, and you can send it instantly by tapping the send button in the upper right corner. Or you may search for a specific place or address using the search bar. You cannot pick a location freely, however. You have to know the exact name or address of the location in order to send it. Open a thread and tap on that little plus button. This will display the menu for attaching items to your message. Hit "Send Location". A map should now appear with your current location marked. You may send this location or any location in the world by moving the map around. Open a conversation and tap on the arrow button. This will give you the option to share a location with the other party. By default, a pin on your current location will be dropped. To send a specific location manually, you may either locate it using the search bar, or find it yourself by tapping on the "Hide Places" button, which will let you move the map around freely. By now you should know how the routine goes. Open a thread and tap on the location button. A map with your location will appear. You may either send it or choose another location by searching for it. Alternatively, long-pressing on the map will drop a pin, which you can send to the other person. Let's say that your recipient is not a big fan of instant messages. Perhaps it is a colleague of yours and you need to contact them via email or something similar. In that case, you may share a location straight from the Apple Maps application on your iPhone. To do that, you must select your current location or drop a pin at the location you wish to send. Then tap on the share button in the upper right corner. From the share sheet, pick the app through which you wish to share that location. It can be Messages, the email client, Facebook, Twitter, or your favorite email client. And that's pretty much it. In rare cases, the methods above might not work exactly as you'd want them to. For example, you might have already started writing an email or a document, and attaching a location to an existing paper can be tricky. But impossible it is not. You still have the option to manually copy and paste a link to a point on a map. To do that, select your current location or drop a pin at a desired spot in Apple Maps. Tap the share button and select the Notes app to save the location as a note. Then open the note you just created, long-press on the location to copy it, and paste it in another app. A link to Apple Maps will appear. This link should work even if the recipient doesn't have Apple Maps on their device.